UPDATE: Due to weather impact, the registration deadline has been extended to Friday, August 31st (for application by online form–see original post for link, or by email to jahilo@jahawaii.org or text to 808-292-0570). The JA Company Program is gearing-up for fall 2018. 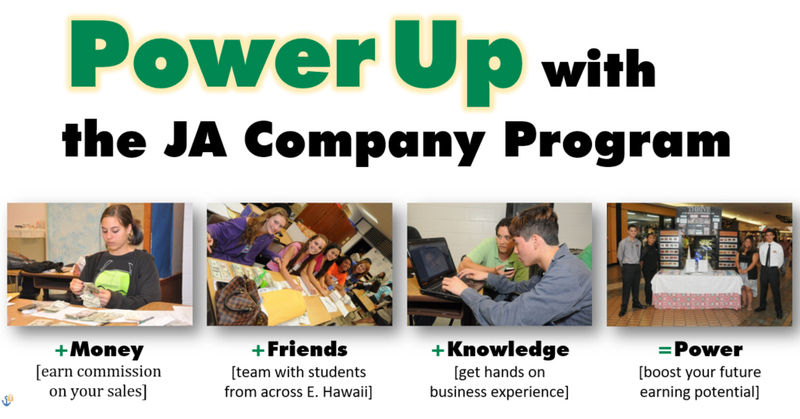 From September through December, East Hawaii high school students will meet on Tuesday nights to create their company, manufacture and market products, give back to their community, make friends, and hopefully also make some money. If you know of high school students who may be interested in the program please have them contact their social studies teacher or school office for a JA application, or signup online here. The deadline to apply is Monday, August 27th and Application Night is Tuesday, September 4th from 6:00 to 8:30pm at Hilo High School (note new location for Application Night only). The program itself is held on Tuesday evenings from 6:30 to 9:00pm at Waiakea High School through December 11th. If you have questions about the program, or if you are a business professional interested in helping to advise one of the teams, please contact JAHI district manager, Alan Shiraishi at jahilo@jahawaii.com or 808-292-0570.